Have you ever fancied a hot chocolate that could serve as a meal in itself? Devour offer just such a drinking option. There really should be a size warning on the menu! 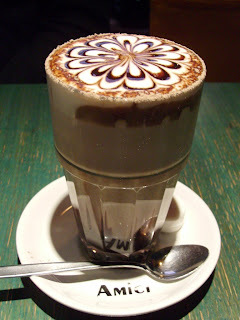 The $4.50 drink comes in a tumbler, not a mere cup; is exquisitely decorated; and contains a winning amount of chocolate syrup. At that size, it's something you'd want to take slowly, but on this occasion it was somewhat tepid, so it was a matter of get into it or be relegated to slurping a sorta-warm chocolate. Luckily there was time to be taken. Any trip to Devour leads SG or me to the Devour Burger, a divine, decadent meal that sports a pattie so enormous it carries a minimum 30 minute preparation time. 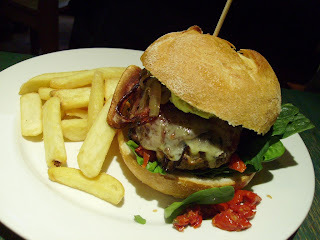 When the burger arrives, it's speared with a skewer in order to keep the tennisball pattie sandwiched between the kaiser bun along with cheese, avocado, sun-dried tomatoes, spinach leaves, caramelised onions and tomato chutney. They've left no filling preferences to chance! The dish comes with a choice of eggplant or potato chips. I'm yet to sample the former, but the latter are extraordinary. They're chips of the long, flat kind, crisp and doused in delectable seasoning. Devour also does a fine line in specials, particularly on their breakfast menu (eg their famous baked eggs). One of today's options was Eggs Krumpin. Something to do with eggs and crumpets, perhaps? Indeed! Two crumpets done french toast-style: dipped in egg, cream and parsley, then fried and served with bacon, maple syrup and Devour's baked beans (home-made, served with herbs and chilli). All very intriguing, but unfortunately my curiousity remained as unsated as yours...they were out of beans (out of beans! It's a Thornbury tragedy). 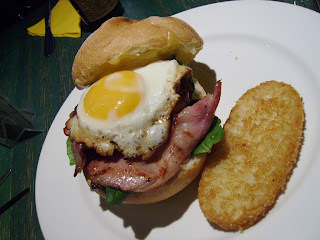 Second choice was their Breakfast Burger: everything good about a fry-up, but this time wedged between two slices of bread rather than beside. The bread in question is a Kaiser bun: a huge, round roll with a little pointy bit at the top - looks like an old-school helmet or a crown. Inside said bun is sausage, bacon (happy the carnivore), a fried free-range egg, spinach, tomato chutney and a huge smear of melted cheese on the top half. As if that wasn't enough, nestled beside the burger was a hashbrown: deliciously crispy and salty crumbing around moist, fall-apart potato. Who needs chips? Devour is a small cafe, always welcoming. 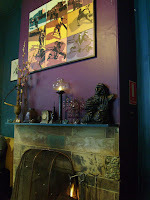 The fitout is all warm colours, with teal walls and drapes. The front section is brightened by sun coming through the plate glass windows; the slightly elevated back section is a warm place to sit by the fire, admire the artwork and work your way through a hot drink. There's also a courtyard out the back if you want to take in some sun, maybe with a locally brewed 3 Ravens beer. I know - and it is very sad. I saw the sign on my way past a few weeks ago and hadn't brought myself to go back and check for sure that it was true.